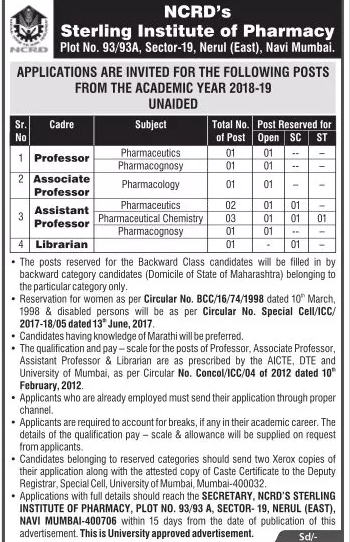 NCRD's Sterling Institute of Pharmacy, Navi Mumbai has advertised in Loksatta for the recruitment of Professor/Associate Professor/Assistant Professor jobs vacancies. Interested and eligible job aspirants are requested to apply with in 15 days. Check out further more details below. About College: NCRD's Sterling Institute of Pharmacy is located in Nerul which is the biggest residential node of Navi Mumbai. It is situated in a serene and peaceful enviornment and is easily accesssible by rail from the Seawoods station on the harbour line between CST- Panvel and by road from the National Highway-4 or the Palm Beach road.